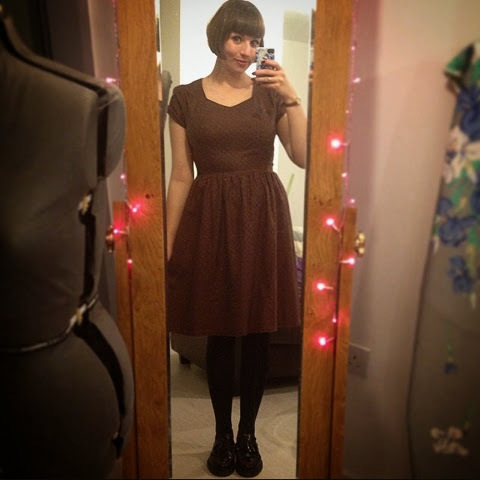 So this post is about something I've been working on for quite a while and I'm really excited to share... My very first self-drafted sew! 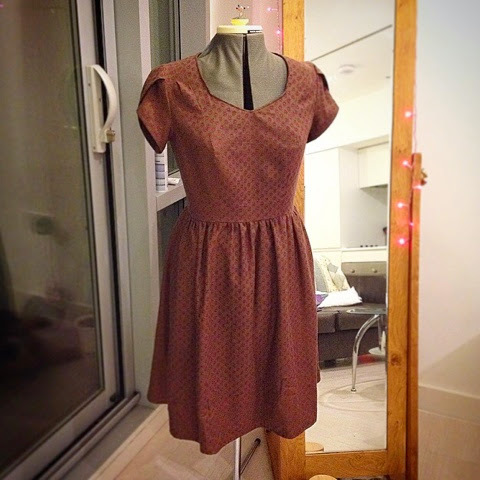 I mentioned that I was going to an evening course in pattern drafting a little while back, and this is my first finished garment - a sort of wearable muslin and product of the pattern pieces I've been working on. The course is very self directed. 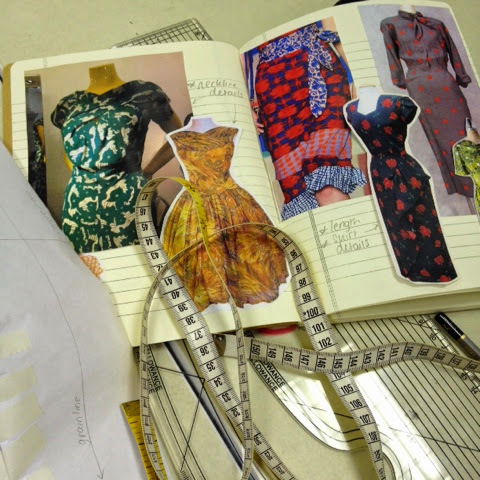 I just took along a mood board in the first week and ended up using one of the dresses as my main inspiration (the one in the middle on the right hand page, I think it might be Viven of Holloway). It has quite a vintage feel and a few features and techniques that made it interesting and just the right amount of a challenge to draft. 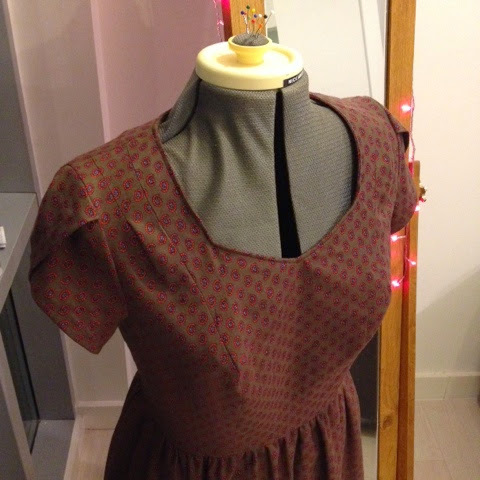 I removed that humongous breast-accommodating dart on the front bodice in favour of a princess seam. I usually avoid princess seams because the prospect of adjusting them to fit my bust fills me with dread, but now I have a block it's easy peasy! 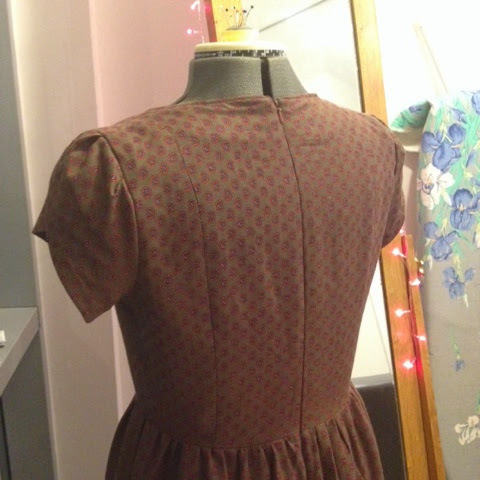 I took the princess seams all the way though the back bodice too so they match nicely at the shoulder seam. 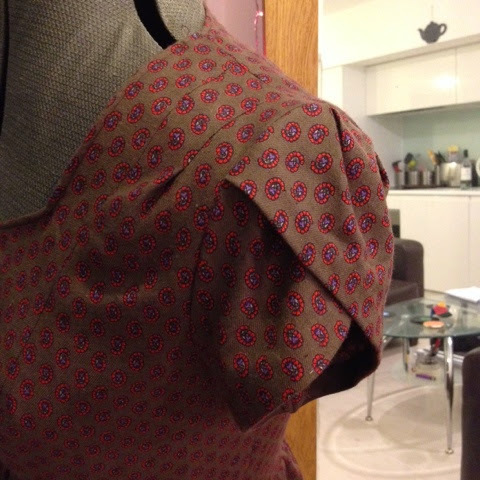 Then, like my inspiration image, I added this neat little pleat on the outside shoulder. 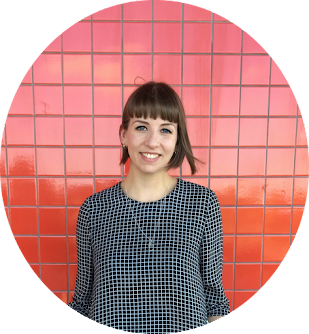 I opened up the neckline and took it into a shallow v shape, which is actually really flattering. Much to my tutor's umm... disgust.... 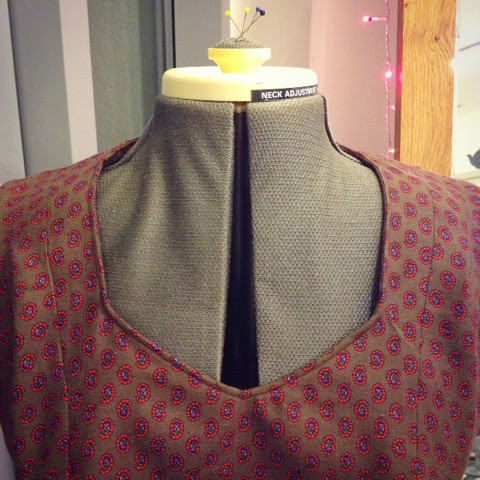 I top-stitched the neckline. I don't think it's so bad to be honest, but in what felt like true Project Runway style, he said that the top-stitching 'absolutely killed it' (and not in a good way haha). Following this, I did get shown how to properly draft and apply a facing, and how to understitch so you never get a peek of it from the outside. Never going to attempt dodgy topstitching again! On the plus side, the tutor did say that my concealed zip was excellently executed - hooray! Even I can't believe how well I matched all the seams! I drafted basic sleeves from a ready-made block, and then from that, worked them into two pieces to form a petal. 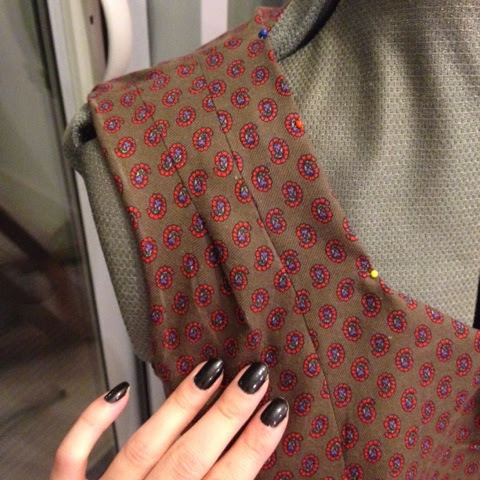 There's a small box pleat on top to add fullness, and a couple of small pleats in there. I love the sleeves, but they feel just a little bit tight in the back when the dress is being worn. I think I need to make them a little bigger (cut and spread technique maybe..?) 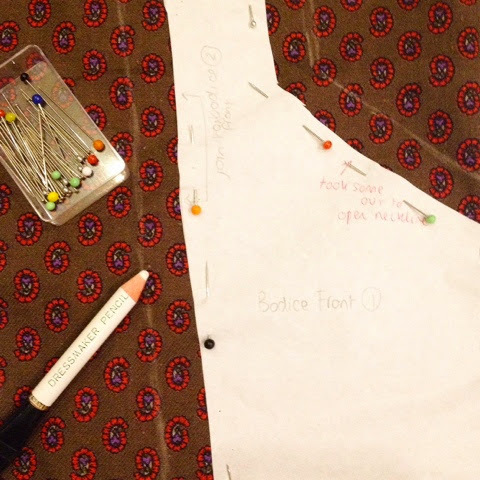 and slightly gather then into the back bodice to add a bit of ease. One look at that dress and I had the intention to buy the pattern! Really beautifull! So great you made it yourself! Congrats! Oh my goodness, this is amazing! I love so much about your dress - the shoulder pleats, the petal sleeves, the top-stitched neckline (that caught my eye straight away - your tutor is so wrong!). 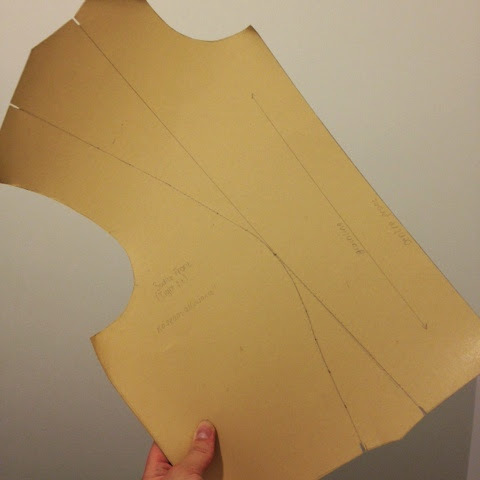 This is an interesting post for me, as I am learning pattern drafting too; but sadly not at a class, as there are none where I live - I've been using Craftsy classes. Good luck with your drafting adventures, I shall look forward to reading about them!